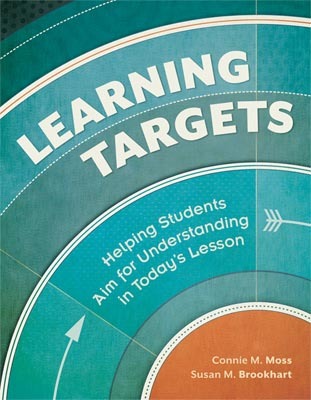 In Learning Targets, Connie M. Moss and Susan M. Brookhart contend that improving student learning and achievement happens in the immediacy of an individual lesson—what they call "today's lesson"—or it doesn't happen at all. The key to making today's lesson meaningful? Learning targets. Written from students' point of view, a learning target describes a lesson-sized chunk of information and skills that students will come to know deeply. Each lesson's learning target connects to the next lesson's target, enabling students to master a coherent series of challenges that ultimately lead to important curricular standards. Situates learning targets in a theory of action that students, teachers, principals, and central-office administrators can use to unify their efforts to raise student achievement and create a culture of evidence-based, results-oriented practice. Provides strategies for designing learning targets that promote higher-order thinking and foster student goal setting, self-assessment, and self-regulation. Explains how to design a strong performance of understanding, an activity that produces evidence of students' progress toward the learning target. Shows how to use learning targets to guide summative assessment and grading. Learning Targets also includes reproducible planning forms, a classroom walk-through guide, a lesson-planning process guide, and guides to teacher and student self-assessment. What students are actually doing during today's lesson is both the source of and the yardstick for school improvement efforts. By applying the insights in this book to your own work, you can improve your teaching expertise and dramatically empower all students as stakeholders in their own learning. "Moss and Brookhart present a very clear discussion of how to make students more accountable for their work. This book would be especially beneficial for new teachers looking for ways to get students more involved in the learning process." —Thomas Hansen, independent consultant, Chicago, Ill.
CONNIE M. MOSS, Ed.D., is an associate professor in the Department of Educational Foundations and Leadership in the School of Education at Duquesne University and director of the Center for Advancing the Study of Teaching and Learning (CASTL). She served for 25 years as a K–12 educator, spending 17 of those years in early childhood, elementary, and middle school classrooms. She continued her public school service as an educational leader of multidistrict, regional, and statewide initiatives in curriculum planning and assessment. The recipient of numerous teaching awards, she has been an invited speaker and presenter in over 600 school districts, 100 universities and colleges, and many educational associations and organizations. SUSAN M. BROOKHART, PhD, is an independent educational consultant based in Helena, Mont. She has taught both elementary and middle school. She was professor and chair of the Department of Educational Foundations and Leadership at Duquesne University, where she currently serves as senior research associate in the Center for Advancing the Study of Teaching and Learning in the School of Education. She serves on the state assessment advisory committee for the state of Montana.